Churchill’s Irish Brigade fought in North Africa, Sicily, and Italy to prove their loyalty to king and country. It was a letter in the London Times that caught the attention of British wartime Prime Minister Winston Churchill. “It appears that very large numbers of Irishmen have joined H[is] M[ajesty’s] Forces since the outbreak of war,” wrote retired General Sir Hubert Gough in September 1941. Gough went on to suggest that the fighting spirit of the Irish was particularly strong when they served in units grouped together under an Irish banner. Just as American neutrality was not compromised by Americans volunteering to serve in the Eagle Squadron of the RAF, he recommended that Irish and Anglo-Irish serve together in an Irish brigade. Churchill loved the idea, and in an unguarded personal minute to the Secretary of State for War he wrote: “I shall be glad to have an expression of opinion from the War Office on this suggestion. We have Free French and Vichy French, so why not Loyal Irish and Dublin Irish?” Churchill’s enthusiasm for an Irish Brigade was strengthened when he saw extracts from letters secretly intercepted in Northern Ireland for a Postal Censorship Report. It was the political ramifications of an Irish Brigade that concerned David Margesson, Secretary of State for War, and Viscount Cranborne, Secretary of State for the Dominions, in their joint reply. They liked the idea of an official show of appreciation to all the volunteers coming from Eire, but they also did not wish to disrupt this flow. It would be estimated by the Dominions Office that some 43,000 Eire-born Irish men and women had joined the British services by the end of the war. Consideration was given to establishing a Shamrock Squadron, formed from “men of Irish blood from all parts of the world,” but the view of the Air Ministry was that there was no demand for this within the service and that Irishmen would object to being removed from their current units. The only positive suggestion was to brigade together existing British Army Irish battalions—such as those from the Royal Inniskilling Fusiliers, Royal Irish Fusiliers, and London Irish Rifles. 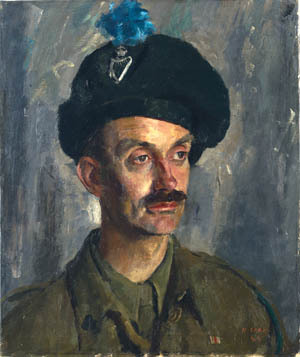 Major The Viscount Stopford, an officer in the London Irish Rifles (Royal Ulster Rifles), wears the distinctive bonnet known as a caubeen (portrait by Henry Carr, 1944). Somewhat deflated by the arguments coming from the War Office, Churchill scribbled his own reply on this joint memorandum: “As proposed. It is a halfway house.” But, as if this wasn’t disappointing enough, word of the suggested Irish Brigade got to John Andrews, then Prime Minister of Northern Ireland. In the end, it was the will of Winston Churchill that prevailed, although in the moderated form suggested by the War Office. In January 1942, the 38th (Irish) Brigade came into being, consisting of the 1st Royal Irish Fusiliers, the 6th Royal Inniskilling Fusiliers, and the 2nd London Irish Rifles. The London Irish were a Territorial unit associated with the Royal Ulster Rifles. The Irish identity of the brigade was strongly established from the outset with a saffron-kilted pipe band for each battalion, a songbook full of Irish songs, and soldiers wearing the caubeen—a traditional Irish beret or tam o’shanter-style headdress worn with a feather hackle favored by Irish warriors since at least the 17th century. Its first commander was Brigadier Morgan O’Donovan, who adopted the traditional clan title of “The O’Donovan.” He was soon succeeded by Brigadier Nelson Russell. The Irish 38th first went into action in November 1942 as part of the Anglo-American landings in French North Africa at Algiers in Operation Torch. It was the dramatic beginning to a very long and bloody series of campaigns for Churchill’s cherished Irish Brigade. Edmund “Ted” O’Sullivan was a typical London Irishman. Born in Peckham in 1919, his father’s side of the family had come from Limerick in the 19th century, and his mother’s side from Kerry. Raised a Catholic and winning a scholarship to the Brompton Oratory, he had just got his first job as a clerk at the uniform makers Hawkes of Saville Row, when the war came. Called up in September 1939 into the 2nd Battalion of the London Irish Rifles, he spent the first three years of the war in training, including shooting practice on center court at Wimbledon. Promoted to Color Sergeant, O’Sullivan was one of the Irish Brigade that landed in North Africa in 1942. 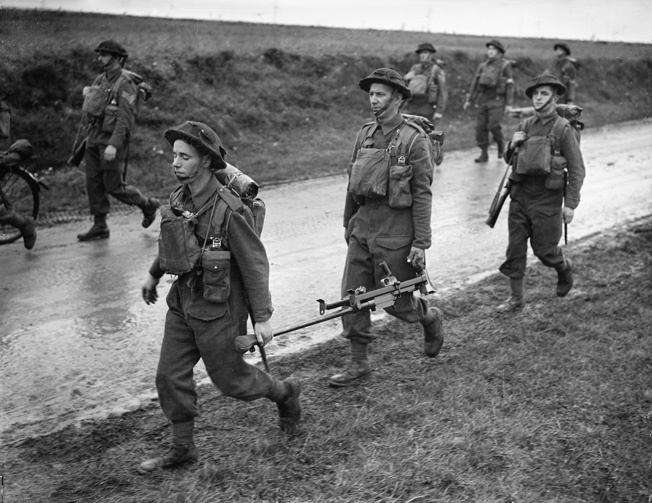 Men of the Royal Irish Fusiliers, part of the British Expeditionary Force sent to France after war was declared, march down a wet road at Gavrelle, near Arras, October 17, 1939. The two men in the foreground are carrying a 14.3mm Boys antitank rifle. Their first night in North Africa, sunlight ended abruptly at 6:00 pm, and the soldiers of the Irish Brigade had to huddle together under greatcoats and antigas capes against the intense cold of the night. The next morning, they had breakfast of biscuits spread with margarine and jam or potted meat, washed down with tea. Part of the 6th Armored Division, the London Irish and the rest of the 38th Brigade were transported by lorries to the battlefront in Tunisia along roads in the Atlas Mountains. The Italian-German forces were dug in along a north-south line 30 miles west of the capital of Tunis. The main Allied offensive came in January 1943. The weather was poor and heavy winter rain turned the ground to mud. The London Irish were tasked with taking Point 286 on January 20, a hilltop held by the Germans in the northern Bou Arada sector. They took it just after dawn, but were swept off it in a counterattack supported by tanks and armored cars. As the London Irish went back to wrestle them off the hill, the Germans called in Stuka dive-bombers. Throughout the fighting, Color Sergeant Ted O’Sullivan was back at the supply base getting hot food for his men. When he arrived at the captured position, he was shocked to see that several key officers had been killed or wounded. “It was a shambles,” recalled O’Sullivan. “There seemed to be no order or discipline.” Some of the NCOs had dropped their weapons and fled. A total of six officers and 20 other ranks were killed, eight officers and 78 other ranks wounded, and at least 136 other soldiers recorded as missing but later confirmed as either wounded or made prisoner. Brigadier Russell considered it a tough but critical clash, whereas O’Sullivan believed it was poorly executed with men exhausted by previous night patrols. Along with the other color sergeants, O’Sullivan was rebuked for not promoting NCOs from the survivors. “The whole exercise was nonsense and the three color sergeants had been used as scapegoats,” he commented bitterly. In February, the Germans, led by General Erwin Rommel, assaulted the British and American lines. On the 26th, they came back to the Bou Arada position, west of Tunis, held by the London Irish. Once the Germans reached the rest of the Irish Brigade, they found the Brigade clinging on to their positions and, after 24 hours of hard fighting, the Germans had had enough and withdrew. A hill near Hadj was retaken with an artillery barrage. The German breakthrough failed, and the Allies pushed on toward Tunis. After a period of rest, the Irish Brigade, including the London Irish, were transferred to the 78th Infantry Division. On April 22, 1943, a massive Allied barrage crashed down on the Germans, and the Irish Brigade played their part in the assault on the German lines that eventually cracked. The Irish Brigade was given the honour of first entering Tunis, but they were not too sure what sort of reception they would get. Just in case, recorded Russell, “The troops were all loaded up with bombs, PIATs (Projector, Infantry, Anti-Tank), mortars and petards—all set for a bellyful of street fighting—and the last lap.” They needn’t have worried. “I remained in my three-tonner,” said O’Sullivan, “which soon became bedecked with flowers. The men were garlanded, kissed, and cheered by the French colon[ial]s, who were relieved the war was over for them with little damage to their home.” Brigadier Russell was kissed twice by the delighted citizens. At a victory parade on May 20, the Irish Brigade marched in their caubeens with saffron-kilted pipers before Generals Dwight D. Eisenhower, Harold Alexander, and Bernard L. Montgomery. Kenneally then repeated this exploit two days later, inflicting so many casualties on the Germans that they cancelled their planned assault on the Allied lines. Although wounded in this attack, he refused to give up his Bren gun and carried on fighting throughout the day. 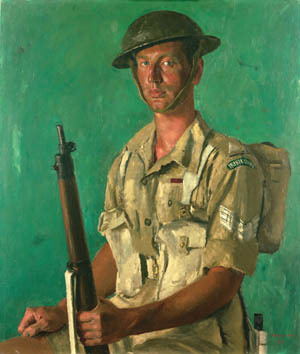 Sergeant John Patrick Kenneally, shown here in a portrait by Henry Carr, earned the Victoria Cross, Britain’s highest military award, for his actions in Tunisia, April 28, 1943, while serving with the 1st Battalion, Irish Guards. Kenneally, however, was half English and half Jewish; his real name was Leslie Jackson (aka Robinson). It was an extraordinary achievement, but Kenneally wasn’t all that he seemed. In fact, he wasn’t Irish at all, but half-Jewish—from Birmingham, England. He was born Leslie Jackson, but his mother changed it to Robinson. When war broke out, he joined the Royal Artillery in an antiaircraft battery, but found this boring, and so he deserted. In Glasgow, he fell in with a gang of Irish laborers who gave him a fake identity as John Patrick Kenneally and a fake past that included a childhood in Tipperary, Ireland. Under this name he joined the Irish Guards. In July 1943, the Irish Brigade took part in the Allied invasion of Sicily. It was the steppingstone toward attacking Mussolini’s Italy, considered the “soft underbelly” of the Axis forces. The Americans had a relatively smooth advance across the island, but the British and Canadians took the brunt of German resistance as they tried to cover their retreat to the Italian mainland. For Colour Sergeant Ted O’Sullivan it wasn’t just the Germans that posed the greatest threat. Worn-out 25-pounders delivered their shells short of the enemy, endangering their own side, while malaria and dysentery invalided many men, including O’Sullivan. Even a period of rest had its dangers, as the colour sergeant nearly drowned in strong currents off the island as he tried to swim to a nearby beach; two other adventurous soldiers were not so lucky and perished at sea. On September 24, 1943, the Irish Brigade landed at Taranto on the heel of the Italian mainland. Now part of the British Eighth Army, their mission was to advance along the Adriatic coast, breaking through two German defensive lines from Termoli to Ortona. It was merciless work. Following this, the Irish Brigade was shifted west to a posting in the Apennine Mountains. Fresh British soldiers joined them, many not from an Irish background but willing to adapt to their new military culture. 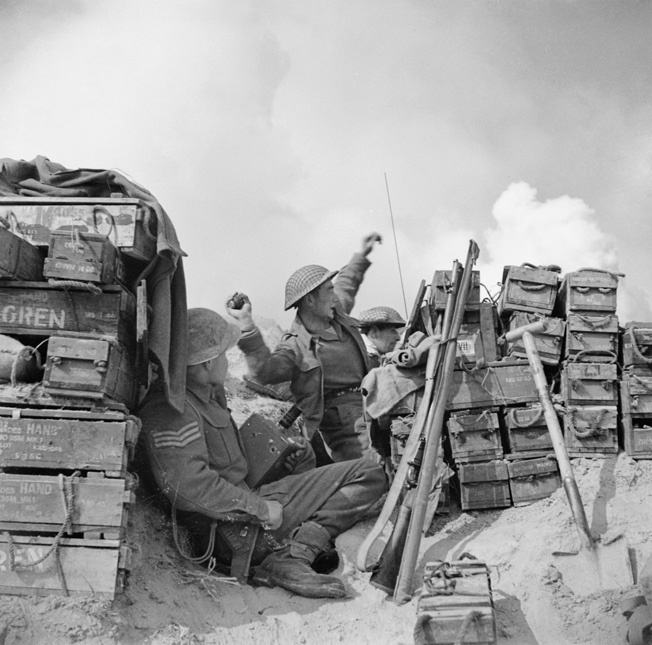 Taking cover behind a stack of ammunition boxes, an infantryman of H Company, 2nd London Irish Rifles hurls a grenade at a German strongpoint on the southern bank of the River Senio, northeast of Bologna, Italy, March 22, 1945. In January 1944, elite German mountain troops swooped on a patrol of the London Irish near Campobasso. Properly equipped with white smocks and skis, the Germans briefly captured the frozen-footed Irish until a counterattack released them. In March, a new brigadier, Pat Scott of the Royal Irish Fusiliers, took over from the ill Nelson Russell. Overlooking the battered monastery, the London Irish had to monitor the ongoing battle. Supplies could only reach them by mule up a dangerous mountain track exposed to enemy shelling. Brigadier Scott was impressed by the effort involved. “The Battalion’s administrative teams really came into their own during this period,” he noted—and that praise included O’Sullivan. “The Irish Rifles bakery never failed to produce appetizing cakes for the warriors on the mountaintop,” he said. The London Irish needed something to keep their spirits up as they were unable to dig slit trenches in the hard rock and had to clear up the rubbish and excrement left by the French troops before them. 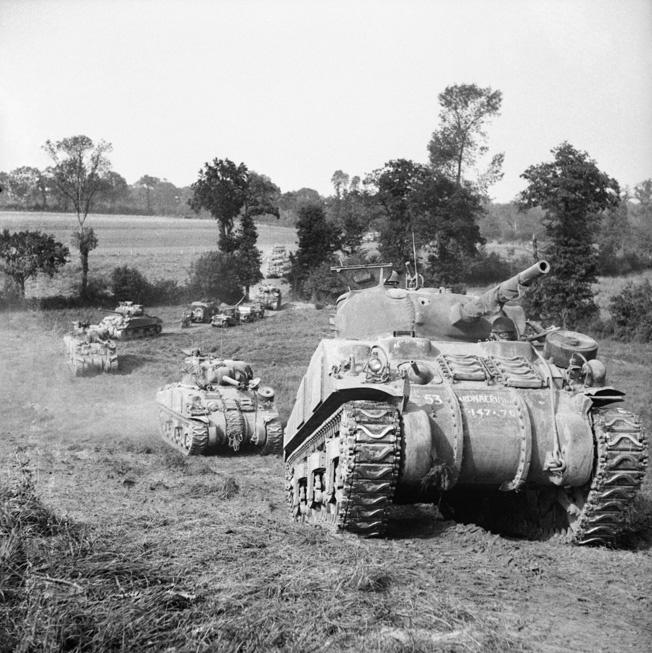 A column of Sherman tanks of 2nd Irish Guards, Guards Armoured Division, advances cross-country south of Caumont, Normandy, France, July 31, 1944. On the 16th, the battle began at 9:00 am with a tremendous artillery barrage by several hundred big guns. The London Irish surged along the road to Sinogogga—a fortified village that was part of the Gustav Line. A few were held up by Germans firing from the cellars of houses, but other riflemen poured into the enemy dugouts using bayonets to finish off the Germans before the barrage had barely passed over them. When the London Irish were halted, supporting tanks from the 16/5 Lancers blasted the enemy positions with high-explosive shells from their 75mm guns. Many of the Germans were caught away from their antitank guns by the artillery barrage and those that managed to get to their guns were shot down by infantry fire. “The show never really looked like stopping,” noted the battalion report. The London Irish were most vulnerable on their open left flank across the Piopetto River when Germans fired heavy machine guns and mortars at them. The Lancers helped by scoring several direct hits on German armored vehicles and blowing up two ammunition dumps. H Company of the London Irish eventually broke into the village of Sinogogga where they had to engage in fierce hand-to-hand fighting for over an hour as the Germans tenaciously defended the shattered buildings with grenades, MG 34 machine guns, and “Schmeisser” MP 40 submachine guns. A self-propelled 75mm gun proved the most deadly of the German weapons, and Corporal Jimmy Barnes from County Monaghan went forward by himself, covered only by a Bren gunner, to deal with the vehicle. He killed one of the German crew with a grenade before being killed himself. Shortly after this, the Germans in the village surrendered. Barnes was unsuccessfully recommended for the Victoria Cross. It took another hour of hard fighting for the rest of the London Irish to take their objectives. In total, their casualties numbered five officers and 60 other ranks. The Germans lost 100 killed and 120 captured, including Hermann Göring paratroopers—their old rivals from Tunisia. Two more days of hard fighting followed until the Germans realized their position was lost and they withdrew—the monastery at Monte Cassino falling on the 18th. Another casualty of the fighting on the Gustav Line was Lt. Col. Humphrey “Bala” Bredin, battalion leader of the Royal Inniskilling Fusiliers. Shot through both legs, he remained in command throughout the battle, propped up in the front of a jeep. Commissioned into the Royal Ulster Rifles in 1936, Bredin had been placed second in command of the Royal Irish Fusiliers during the earlier fighting at Cassino. He was then transferred to command the Inniskillings. Following his recovery from his wound, he took over command of the London Irish Rifles. Thus, he held senior command of all three battalions in the Irish Brigade. Already the recipient of the Military Cross in Palestine before the war, Bredin won a Distinguished Service Order for his leadership in Italy. “Throughout this operation he commanded his battalion with the utmost skill and inspired his men by his examples of personal gallantry under fire,” ran the citation. Famously, he never wore a steel helmet, preferring to wear the Irish caubeen and carry a cane into battle. The Americans got to Rome first, but on June 12 the Irish Brigade accepted a special invitation to visit Pope Pius XII. Brigadier Pat Scott was an Irish Protestant but he most certainly was not going to miss such an honor for the brigade; he faced competition for the limited number of places for the papal audience. 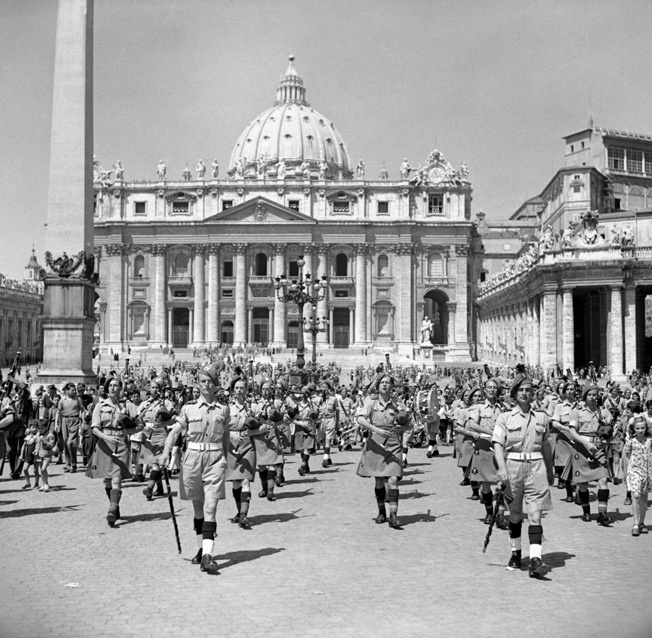 After a special audience with Pope Pius XII, attended by both Catholic and Protestant soldiers, the Irish Brigade band parades smartly in front of St Peter’s Basilica in Vatican City, June 12, 1944. “Many influential members of Orange Lodges were trying to get a seat in the party by virtue of their high rank or long service,” observed Scott. He intended that Catholic soldiers of long service should get first choice, and those born in Ireland, but there were not enough to fill the quota of officers from each battalion so Protestants took the spare places. The Irish Brigade party arrived at the Vatican at 8:45 am and was escorted by the elaborately clad Papal Guards to the audience. Pope Pius XII gave a short speech praising the Irish for spreading the faith around the world to America, Australia, South Africa, and other nations. Scott then asked the Pope if he would like to hear his pipers play. Brigadier O’Sullivan was at the audience and noted the irony of what followed next: “The massed brigade band in their saffron kilts and caubeens with the various colored hackles and regimental badges played ‘Killaloe,’ followed by ‘The Sash My Father Wore.’ This was probably the first and last time one of the signature tunes of the Orange Order was heard in the Vatican. His Holiness tapped his foot to the beat of the martial music and obviously enjoyed the alien sound. The Pope then blessed the rosaries brought by the Catholic soldiers and they knelt to kiss his ring. The Orangemen remained in their seats. 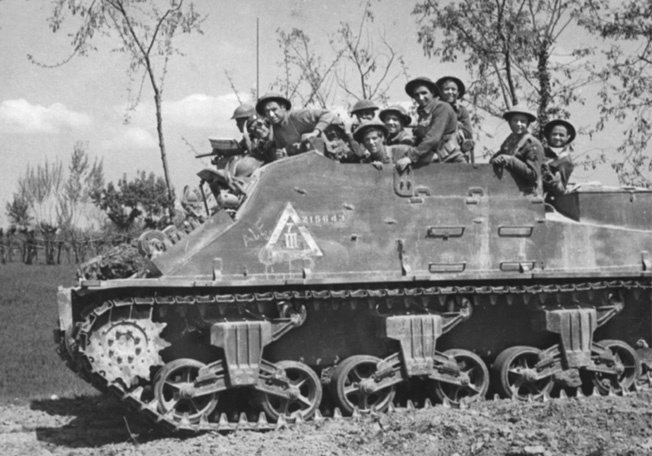 Men of the 2nd Battalion, London Irish Rifles, part of the 38th Irish Infantry Brigade, ride into battle in Italy in a “Kangaroo”—essentially a tank that British and Commonwealth units converted from a gun platform to an armored personnel carrier. O’Sullivan suffered a recurring bout of malaria he had picked up in Italy, and his leave was extended. It was during this rest period that he met an ATS (Auxiliary Territorial Service) officer who later became his wife. His soldiering finally ended in August 1946. “By that time,” he recalled, “I would have spent six years and 10 months in the Army instead of the six months which I was originally called up to serve in October 1939.” After the war, Ted settled in Farnham Common, England, with his wife to run a newsagent and tobacconist store. The Irish Brigade ended the war in Austria, having fought their last major combat south of Italy’s Po River. From its initial fighting in Tunisia, all the way through Italy, the Irish Brigade lost more than 900 men killed of all ranks. Tags Allies, Apennine Mountains, Austria, Axis, Battle of Britain, Bernard Montgomery, Bren Gun, British Eighth Army, british military history, Clement Attlee, Dwight D. Eisenhower, Eagle Squadron, Erwin Rommel, European Theater, Franklin D. Roosevelt, Gustav Line, Harold Alexander, Hermann Göring, Invasion of Sicily, Irish Brigade, Irish Republican Army, Italian Campaign, Italy, Monte Cassino, Morgan O’Donovan, Mussolini, north africa, Operation Torch, Paddy Finucane, PIAT gun, Projector Infantry Anti-Tank, Royal Air Force, Sicily, Sir Hugh Gough, South Africa, Spanish Civil War, Tunisia, Winston Churchill.